Bolshevik by Boris Kustodiyev, 1920. The October Revolution or Bolshevik Revolution, led by Bolshevik leader Vladimir Lenin, took place in Russia in 1917. Lenin returned from exile when the tsarist (czarist) rule ended and by a coup against the social-democratic government of Alexander Kerensky he led the Bolsheviks into power. The Congress of Soviets, in 1917, was made up of representatives of local soviets which, in turn, were supposedly elected primarily by workers and peasants in the various local districts; in reality, the Bolsheviks secured the delegates by the use of violence and intimidation. In the Congress of Soviets which met at the beginning of November 1917, the Bolshevik party had a majority. This Congress then declared itself to be "the government": that is to say, it claimed sovereignty and declared that sovereignty was no longer possessed by the Kerensky government which was based on the remnants of the old Russian Duma and had been in power since the February Revolution. The Soviet Congress then proceeded to enact the chief initial measures of the new regime and to elect an executive - the Council of Commissars. Lenin was dictator of the Soviet state under a system of Marxism-Leninism, involving iron control of the party and the people, until his death in 1924. After his death, a power struggle between Leon Trotsky and Joseph Stalin ostracized Trotsky and brought Stalin to power. Stalin would eventually have Trotsky assassinated, and his increasing paranoia was manifested in a bloody series of purges from the mid-1930s onwards. The October Revolution and the Bolsheviks owed a lot of their acts to the French Revolution, and as such, they planned on a line of statues commemorating various figures from the French Revolution, called monumental propaganda, to put into context their struggle. However, for various reasons, only Georges Danton and Robespierre actually were raised as statues, and one of the statues of Robespierre was destroyed due to inferior construction bases. 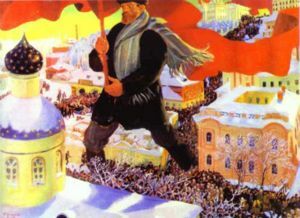 The confusion about the naming of the October or November Revolution is because at the time the Russians still used the Julian calendar, which meant that it was around a month behind the more modern states who used the Gregorian calendar, so for the other states the revolution occurred in November, but to the Russians it occurred in October. Bolshevik, in Russian, means majority, while Menshevik means minority. ↑ James Burnham, The Managerial Revolution, Indiana University Press, Bloomingham 1966. This page was last modified on 9 April 2019, at 13:32.